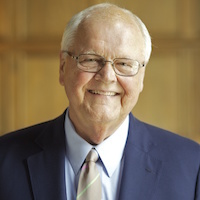 James Wright is a historian, President-Emeritus of Dartmouth College and a former Marine. He is the author of the widely acclaimed Those Who Have Borne the Battle: A History of America’s Wars and Those Who Fought Them (2012). Wright is the son of a World War II veteran, and served in the Marine Corps before entering college. He received a Ph.D. in American history from the University of Wisconsin, Madison in 1969. He then joined the faculty of Dartmouth and from 1998 to 2009, served as the college’s 16th president. He began visiting military hospitals in 2005. In over 30 visits since then, he has encouraged the injured servicemen and women to continue their education. Wright worked with the American Council on Education to create an educational counseling program for wounded U.S. veterans. It has served several hundred injured veterans since 2007. Wright was involved in developing the Yellow Ribbon Program that provided for private institutions to be included in the Post-9/11 G.I. Bill. Wright is currently working on a book on the Vietnam War. He serves on the Board of the Semper Fi Fund/America’s Fund and is on the Campaign Leadership Committee of the Vietnam Veterans Memorial Fund.